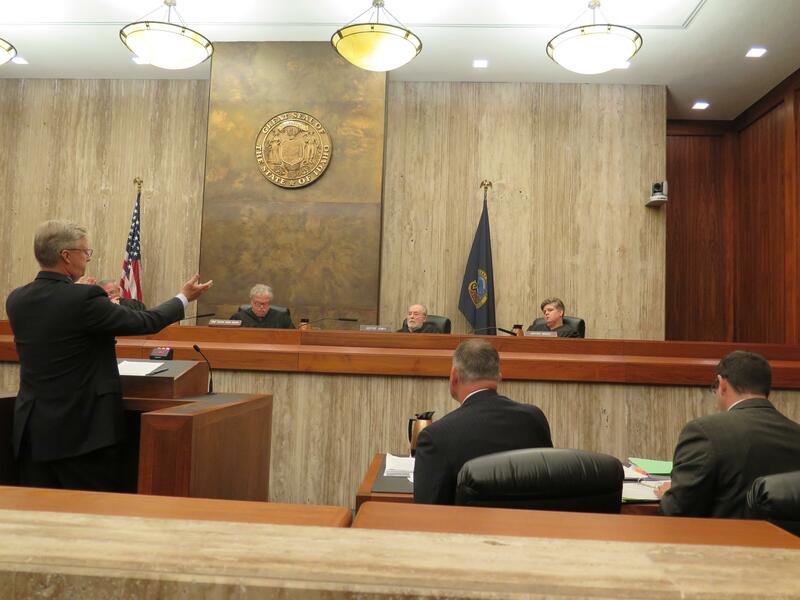 BOISE – Four Idaho Supreme Court justices had sharp questions for both sides as they heard arguments Thursday in a court challenge to Gov. Butch Otter’s veto of legislation repealing the state’s sales tax on groceries. Bryan Smith, attorney for a group of 30 legislators who wanted the tax repealed and sued to invalidate the veto, came away confident. Cenarrusa is the 1978 Idaho Supreme Court ruling, in Andrus v. Cenarrusa, that held that once lawmakers have adjourned their session for the year, the governor has 10 days from the time he receives any particular bill to either sign it, veto it, or have it become law without his signature. The 3-2 ruling has gone unchallenged for 39 years, but last year, in a different case, two of the current justices signed a concurring opinion strongly suggesting they thought the Cenarrusa decision was wrong. At issue: Whether the wording of the Idaho Constitution really envisioned starting that 10-day time clock ticking when the governor gets the bill, or whether it starts ticking the moment the legislative session adjourns. By the former standard, the veto was valid. By the latter, it came too late – meaning the bill would become law without the governor’s signature. “I’m having a great deal of trouble finding ambiguity within the phrase ‘10 days after adjournment.,’” Justice Joel Horton told David Hensley, attorney for Otter. Hensley responded, “I would caution the court not to look just at the 10-day language. I would point the court’s attention to the entire sentence, because it says ‘unless the legislature by adjournment shall prevent its return.’” The Cenarrusa case found that all those words have meaning, he said, and suggest the final part of the sentence assumes the governor has a bill in his possession that he’s considering vetoing. “Otherwise … how can he return that which he does not have?” Hensley asked. The case, argued before a courtroom filled to capacity while overflow crowds watched a live stream, involves more than just the 6 percent sales tax on groceries, which in itself is a big issue. If repealed over two years as envisioned by the bill, the state would collect $80 million a year less in taxes, and Idahoans would pay 6 percent less for their groceries. But larger issues raised include the powers of all three branches of Idaho’s state government, from lawmakers exercising legislative powers, to the executive branch as a check and balance, to the courts and their role. The Cenarrusa decision held that if the clock starts ticking at adjournment, lawmakers could simply delay delivering a bill to the governor until 10 days have passed – eliminating his ability to veto it. During Thursday’s arguments, Chief Justice Roger Burdick said that nearly happened in 1967, when lawmakers delivered a bill to then-Gov. Don Samuelson on the ninth day after they’d adjourned. He swiftly vetoed it. But Burdick also noted that governors often receive dozens or even hundreds of bills after lawmakers adjourn, thanks to the end-of-session rush of decisions; that’s why the Constitution guarantees the governor time to review them and make his decision. After the arguments Hensley said he considered the hearing fair. Four of the five justices were present for the arguments; Justice Daniel Eismann, an outspoken conservative, was out sick. After hearing the arguments, the court took the case under advisement, and will issue its written ruling in the coming weeks. Published: June 15, 2017, 12:52 p.m. Updated: June 15, 2017, 10:12 p.m.